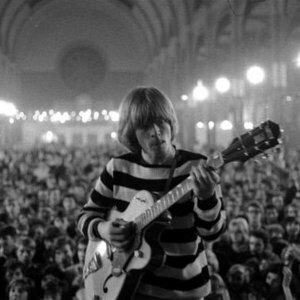 Brian Jones (28 February 1942 ? 3 July 1969) was a founding member of The Rolling Stones. He came up with the name, "Rolling Stones" from Muddy waters' signature tune, "Rollin' Stone." He was a musical prodigy and could play every instrument he ever picked up. Brian Jones' long time drug use forced the Stones to kick him out of the band, right before his tragic death at the age of 27. Brian was found dead in the pool of his East Sussex country house, Cotchford Farm.